Blood plasma of cancer patients contains DNA fragments that originate from the tumour. We leverage advanced genomic technologies to extract information from these fragments, using them as a “liquid biopsy” for noninvasive diagnostics and research into the evolution of cancer resistance to therapy. Cancer is a disease of the genome, characterized by and caused by variable patterns of genomic alterations. Cancer is difficult to treat because every cancer is different, and can further evolve over time and in response to treatment. Current methods for monitoring cancer dynamics are limited: protein markers and imaging estimate tumour burden, but can’t assess genomic status. Biopsies give a snapshot of genomic changes, but can’t be used repeatedly. Better methods to study tumour evolution can promote research and greatly improve cancer care. We employ emerging molecular technologies to develop new diagnostic approaches. Our focus is on circulating tumour DNA (ctDNA) as a noninvasive modality to assess evolution of solid malignancies. This is DNA originating from cancer cells, carrying tumour-specific genomic alterations, that is present as short cell-free fragments in body fluids such as blood plasma. ctDNA can be collected noninvasively via blood samples and has the potential to be immensely informative. The field of prenatal diagnostics is revolutionised by non-invasive tests that assay fetal DNA fragments in maternal plasma. Parallel progress in cancer has been lagging, because genomic loci of interest are not well defined, and levels of tumour DNA in plasma are variable and generally lower: 2 ml of plasma may contain as many as 10,000 copies of DNA from healthy cells but only a few dozen copies of the tumour genome. The mechanisms through which tumour DNA reaches blood circulation are unclear, although fragmentation patterns of DNA in the plasma suggest it may originate from cell death. Overall levels of circulating DNA are higher in cancer patients compared with healthy controls, but these differences are not consistent enough for robust diagnostic tools. Maturation of genomic technologies empowers a different approach that focuses on those fragments that carry cancer mutations. We use a combination of molecular methods such as next-generation sequencing and digital PCR, and develop bespoke data analysis algorithms that allow such data to be used for sensitive measurement of rare alleles. We apply these methods to monitor mutation status and circulating tumour DNA levels in serial samples collected from patients during treatment and follow-up, in close collaboration with clinical and translational research groups. High levels of circulating tumour DNA in cancer patients are a bad prognostic indicator. Changes in circulating tumour DNA levels may indicate response to therapy or disease progression, and indeed may prove to be the earliest indicator of changes to tumour burden (Dawson et al., N Engl J Med 2013; 368: 1199) (Figure 1). Figure 1: Workflow for measurement of circulating tumour-specific DNA as a personalised biomarker. DNA obtained from a patient’s tumour or biopsy sample is used to identify tumour-specific genomic alterations. Assays are designed to specifically measure these tumour-specific DNA sequences. The assays are used to measure circulating tumour DNA levels in blood samples from the same patient. These data are interpreted together with clinical and other diagnostic information and can inform on tumour changes. We have developed methods that allow us to use circulating tumour DNA as a “liquid biopsy” to analyse cancer mutations in a non-invasive way (Forshew et al., Sci Transl Med 2012; 4: 136ra68) (Figure 2). 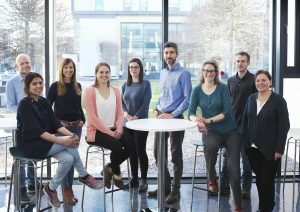 This can identify if a tumour is likely to respond to novel therapies that target specific cancer mutations or molecular pathways, through analysis of a blood test, and can reduce the dependence on obtaining a tumour biopsy which involves invasive procedures. This is especially helpful in clinical scenarios where obtaining a biopsy is not possible due to risks to the patient, but also opens up the possibility of repeated or serial analysis for such mutations during treatment and patient follow-up. Figure 2: This patient presented with advanced ovarian cancer, and was treated by debulking surgery and chemotherapy. Sequencing of an initial biopsy sample (from the right ovary) identified a mutation in TP53, a known tumour-suppressor gene. Fifteen months after surgery, the patient relapsed. We analysed DNA from a plasma sample using a method we developed called TAm-Seq (for Tagged-Amplicon deep Sequencing), which identified an unexpected mutation in EGFR, a known oncogene which can be inhibited by targeted therapies. The same mutation was present in an additional sample collected 10 months later. Retrospective analysis of multiple samples removed at the time of initial surgery showed than the mutation in EGFR was present as a minor sub-clone in tumour masses from the omentum (adapted from Forshew et al., Sci Transl Med 2012; 4: 136ra68). At present, a significant effort in cancer research is in understanding the roles of tumour heterogeneity and evolution on drug response and resistance. Much of this depends to date on collection of multiple biopsy samples from generous patients, which limits its applicability and adds complexity and costs. Together with the Caldas and Brenton labs, we have recently shown that analysis of serial plasma samples can be used to identify mutations that are selected for when cancer relapses after therapy, and are therefore likely to contribute to resistance to the therapy (Murtaza et al., Nature 2013; 497: 108) (Figure 3). We are further developing these approaches, which can provide data in a non-invasive manner and can greatly enhance the pace of research. 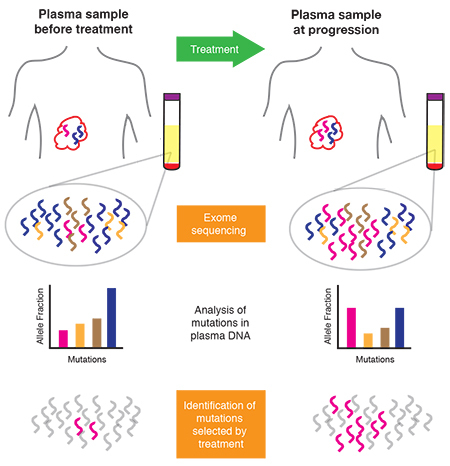 Figure 3: Identification of treatment-associated mutational changes from exome sequencing of serial plasma samples: plasma is collected at multiple time-points during treatment and follow-up of advanced cancer patients. Exome sequencing is performed on circulating DNA from plasma collected before and after treatment. Mutations are identified and their abundance (allele fraction) at different time- points are compared, generating lists of mutations that showed a significant increase in abundance. These may indicate underlying selection pressures associated with specific treatments (from Murtaza et al., Nature 2013; 497: 108).